This will be another one of my quickie posts. I wanted to show you Super Bass on it's own post because I did some different looks for each color. So... By this point I think we all pretty much shattered/ craked out, right? At least I know I am... But Super Bass is really something else, especially when paired with the colors from Nicki's Collection. To see these pairings just keep reading :D! I decided against layering Super Bass over the glitters in the collection because I just do not like how those combinations look. Instead I will only be showing Super Bass over the cremes. Super Bass over Fly. LOOOVE this combo. For this one I applied a slightly thick coat of the shatter in a regular motion. And finally Super Bass over Pink Friday. For this one I applies a thin coat of shatter in a wavy motion. I wore this for a few day and really loved how it looks like Pink and Purple Granite. I'm pretty much done with the whole shatter thing but I really like this one a lot. It seems the shade of Purple varies depending on the base color but it always remains a beautiful shade of shimmery Grape-y Purple. Wow, I do love this over 'Fly' the shimmer in the purple with the teal almost tricks your eyes and looks like some crazy duochrome! I'm over the crack myself.. but still really want this one!! The wavy pattern you did is my favorite of the three! It's very pretty. Wow, the wavy look is cool!! I might try that with some of my shatters that have been put at the back of the drawer. I must admit I didn't like this shatter but you almost make me want it!! I love the combo with Fly and what you did with Did it on 'em looks great! really love it! It looks so cool over Pink Friday. I like how you did the wavy thing. I would never have thought of that. I'm not a fan of the crackle effect, but that one is GORGEOUS! I love the color combo and purple sparkle! I just got back from Ulta and the Nicki Minaj display was ravaged! wow im kinda over crackle too but im loving all of these and i especially love how you did different effects on each one your so creative, and now im upset cuz now i wanna buy them all! I luv the shattered balls, lol! All are cool combos!!! I totally just bought a Reptar shirt from busted tees! Super Base over Fly... LOVE!!!! 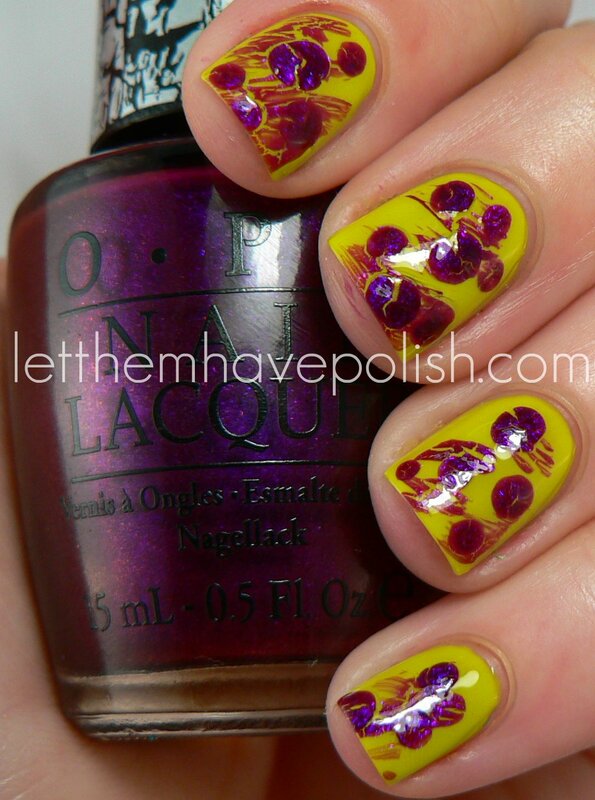 I'm not a fan of crackle but this combo... May have to get it! I love how you did the wavy moton crackle, makes it look really pretty & different, may have to try, probably look awful if I try!! Muffin Monday!! Orly Fresh- New Camera Pics! !